To bring curious compassion to public dialog and to show our commonalities with humour, across what divides us – those grounds that secular democracies prohibit discrimination in law but take far longer and deeper changes to bring about non-discrimination and equality in fact. To demonstrate that there’s a place for everyone in the world, regardless of what they believe – since what we believe is what we make of the universe – and as a consequence, what we make of ourselves. 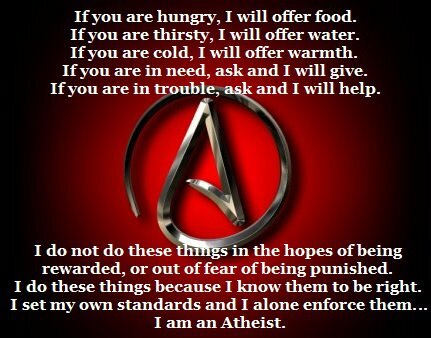 I’m not an athiest, but the words are lovely. Thanks Nina! so this vision statement is entirely my own as a person and as an artist/writer. I was a bit sleep groggy and then, I couldn’t edit what I posted. Please feel free to remove anything that I was inspired to post that you do not feel is appropriate to your blog. I should probably, explain that I had a very bad year last year and I am just so happy with how things are right now, that; well, sometimes, I just cannot contain my joy. so much so, that I finally got around to creating the second half of my lesbian flirting blog. I am sorry that some of that leaked over onto your blog. Thank you for the reminder to be mindful. Please also delete that content. Except, please, not that exclusive poem. I do not have a copy.